In the U.S., Stokely Carmichael has been known for his extraordinary rhetorical skills at the time that the Civil Rights movement was in full swing. Often compared to Malcolm X and Martin Luther King Jr, people considered him an oratorical genius, who knew how to interact with different audiences and adapt his discourse to their response. His name has been associated with the Black Power slogan ever since he gave new meaning to it in a famous speech in 1966. 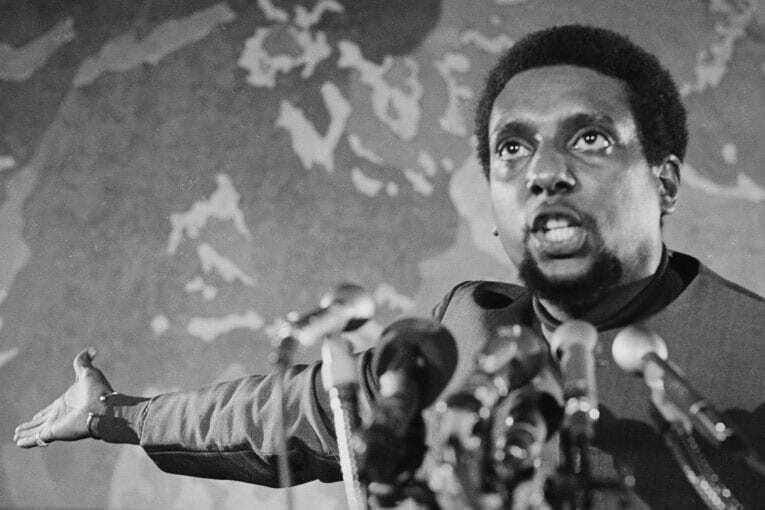 What tends to fall into oblivion is that Stokely Carmichael, who eventually adopted the name Kwame Turé, has also been a proficient grassroots organizer, both in the U.S. and abroad. Within a timeframe of hardly four years, his organizational efforts evolved from the mobilization of black voters in Alabama and Mississippi to the building of a large movement resisting military draft at the height of the Vietnam war. Until his departure for Guinea-Conakry in early 1969 and his subsequent involvement in the All-African People’s Revolutionary Party, he was one of the driving forces behind the development of an independent black political base and an international network in support of deserters from the U.S. military: two of the main issues at the root of the New Left’s worldwide upsurge during the 1960s and 1970s. Stokely, as the whole world called him in those days, died at his home in Conakry on November 15, 1998, at the age of 57, after a life replete with active political struggle. In retrospect, aspects of his personality and commitments may be open to criticism, but no one can deny his inspirational force. Individual icons are also created by the larger movements carrying them. And perhaps more significant than the intricacies of the struggles in which he took part, is the fact that, unlike many of his contemporaries, he never turned his coat or compromised on his own principles. Freshly elected chairman of SNCC, Stokely Carmichael participates in the Walk Against Fear started by James Meredith, and gets arrested. On his release on June 16, 1966, addressing a crowd of 3,000 in Greenwood, Mississippi, he spills his disgust: “We been saying Freedom for six years. What we are going to start saying now is Black Power!” He calls for black people “to consciously begin to organize among ourselves and find the power to affirm and control our legitimate political rights and our full human dignity. Self-determination.” And “to consciously and publicly free ourselves from the heritage of demeaning definitions and limitations imposed on us, over centuries of colonial conditioning by a racist culture.” Later that year, he encourages students at Berkeley, since 1963 the cradle of the Free Speech movement, to join the “Hell No! We Won’t Go!” campaign launched by SNCC against the Vietnam war and the military draft. In the Summer of 1967, he is asked to speak at the Dialectics of Liberation congress in London, where he delivers one of the most concise, clear and beautifully aggressive displays of his political thinking. The congress, with panel discussions that lasted two weeks and eventually spurred a generation of political activists across Europe, had initially been organized around the issue of oppression and individual freedom in Western society. It really started off on the more serious questions of institutional violence and international resistance when mainly two contributors put the Third World on the agenda there, Stokely Carmichael and Monthly Review’s co-editor Paul Sweezy. At the time, my modest self was just a young teenager, and covering the congress my first participation in an editorial for one of the ‘Underground’ publications. After heated debates during a late-night walk through London’s Notting Hill district with Stokely and mutual friends, he suddenly told me, “Boy, yuh really wanna do something useful, yuh contact these people,” pulling out a piece of paper with an address in my hometown. So much so for his practical streak and the start of my involvement in a Europe-wide network encouraging and helping GIs escape to Sweden instead of being sent to Vietnam. Meanwhile, Stokely’s congress interventions were leading to memorable Black Power gatherings at Africa House, demonstrations all over England, and an expulsion order from the UK government. He is delighted to meet with CLR James several times and, from London, starts a hallucinating journey around the world. After a week of discussions with Fidel Castro, Melba Hernandez and other Cuban revolutionaries, he embarks on a plane to Vietnam. Already in the air, his plane is ordered back after information that CIA agents are waiting for him in Madrid to send him back to the States and retain his passport. Another plane via Moscow and Beijing takes him to Hanoi, where he is received by Pham Van Dong and Ho Chi Minh. He continues to Algeria, Guinea and Tanzania, where he meets with political leaders and combatants from most of the African liberation movements. With the help of Shirley Du Bois, he meets African leader Kwame Nkrumah and Guinea’s president Sékou Touré, with whom he will remain closely connected for the years to follow. Ron Augustin is a freelance journalist based in Brussels. Norman Geras falls foul of Reading University’s ‘prevent’ anti-terrorism strategy.